An epic Trip through North and West China in Marco Polo's Shangri La. including the regions into the continent-wide empire of the Mongols and creating the Yuan Dynasty to rule their Cathay Khanate, or China. Ming Dynasty Reign (1368 AD - 1644 AD). During the Ming Era gold was discovered in the North-Eastern Regions, especially in Jilin, leading to active exploitation of these resources. befalling to the Tang Dynasty Empire, whereas the southern half below the Taedong River (now part of North Korea) and Goguryeo Capital were absorbed by Silla. In between, North of the Taedong River, a New Korean State was created, the Balhae Kingdom. The Balhae (Or Parhae or Bohai) Kingdom (698 AD - 926 AD) is first expressely mentioned in the so called "Book of Tang" (compiled 941 AD - 945 AD), the first classic work dated to the long Tang Dynasty Era. Map of the Tang Dynasty depicting the crumbling Tang Dynasty Empire in 742 AD. 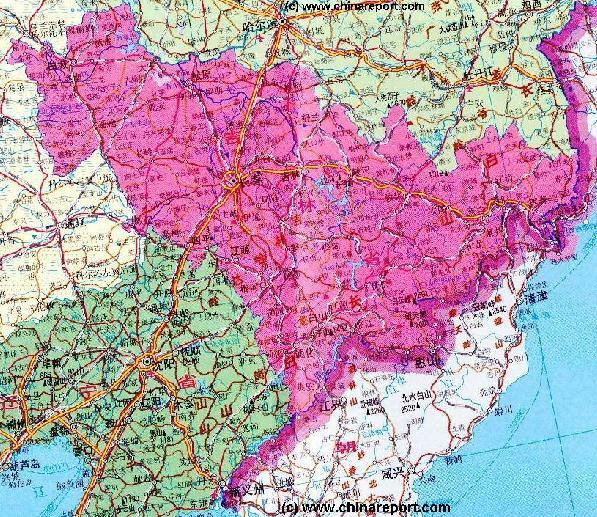 Liaoning Province has fallen out of the influence of the Tang and the State of Balhae now Rules Territories in Manchuria (Liaoning, Heliongjiang and Jilin, as well as parts of the Korean Peninsula. Empire that had briefly become the Liao Dynasty (907-1125 AD) that controlled large parts of Mongolia,North and North-Eastern China and had Buddhism as its state religion. The Khitan Liao Dynasty in turn was destroyed by the Jurchen Tribes, another manchurian peoples unified under the Jin Dynasty of China in 1125 AD. The Ching Dynasty (1644 AD- 1911 AD). 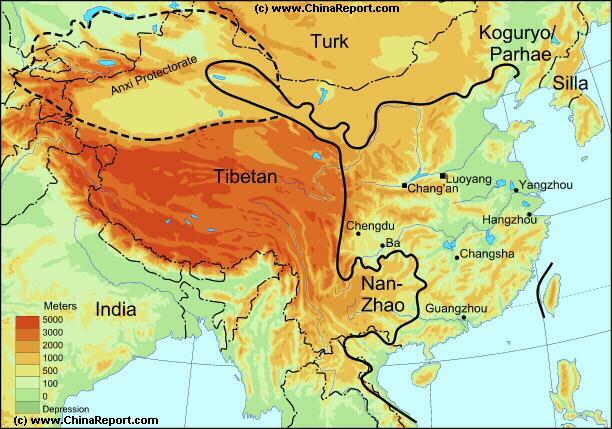 Based upon a conquest of the Manchurian Tribes by the Manchu's, the Ching Dynasty saw a number of Territorial expansions, some of which in the North Eastern Regions. After several campaigns in Manchuria and further North, the Manchurian Provinces included large portions of land North of the HeilongJiang and Amur Rivers in what is now Siberia and the Russian (Maritime) Province of Primorsky Krai. Chinese Territory included large stretches of the Coast of Japan. As was not unusual for disputed border regions that required a high military readiness, all Manchurian Provinces were placed under direct Military Administration, with not a Governor, but the General of Jilin standing at the top of the administration of the regions. During the latest stages of the Ching Dynasty, in 1860 AD, the second opium war (arrow war) saw the Chinese defeated and humiliated by 7 allied and modern industrial powers, and as part of the extortion Russia demanded that these Territories were ceded to Russian hands, as they remain today. In early of 1876 AD, Japanese provocations and confrontations with Korean Nationalists already led to the threat of War with Japan, a danger that could only be alleviated by the the Korean acceptance of an imposed Treaty, the Treaty of Ganghwa. In the event the Japanese did exactly what the Americans had done to Japan in 1854 AD, forcing the secluded Nation of Korea to open itself to Japanese and foreign trade or suffer War. Equally important was the fact that the Treaty required the Koreans to proclaim its independence from China in its foreign relations, effectively breaking a centuries old political relation. Meeting not much resistance to its policies Japan went ahead with its attempts to establish control over the Korean Peninsula. In 1882 AD, after riots broke out in Seoul, the Capital of Korea, and the Japanese Embassy and Trading Posts were attacked Japan further upped the pressure. Although no war ensued, among things due to Chinese intervention by sending troops, the Japanese made sure in the future they would have their own troop presence within the Capital of Korea. The Koreans were forced to allow the Japanese to build barracks and station troops in Seoul. Thus, the Chinese-Japanese competition over Korea was building into an explosive situation. As the Ching Dynasty was already occupied with Internal Wars and Foreign Invasion in their homeland, some time elapsed before the situation first came to a head between the Chinese Ching Dynasty and the Japanese in Korea. In 1884 AD new social unrest in Korea resulted in power-grab by Korean Revolutionaries poviding the final incentives. Although the coup d'etat was cut down by a counter revolution under Chinese Protection, in theory retaining Chinese Control over Korea, during the fighting the Japanese Embassy was attacked and burned. Several Japanese were killed leading to a direct confrontation with Japan. Although at the Time both contestants in Korea, both with troops in theatre, came to a draw and a Treaty (Tianjin 1885 AD) prevented all out war, the stage had been set for a full military confrontation with Japan over Korea (and possibly Manchuria). Overview of Asia showing Territories, Tribes and Nations around the Year 565 AD. CLICK MAP TO GO TO FULL VERSION ! Although Goguryeo had emerged from ethnic tribes in Jilin Province, the Later Goguryeo Kingdom's Capital under King Jangsu was moved to the South, to PyongYang in 427 AD (leading to a conclusion among later Nationalists of the 20Th Century that North-Korea was the rightful representative of Korean Culture and Peoples). While China's Shandong Peninsula saw the Rise of the Northern Wei Dynasty, Jilin (south of the Northern Songhua River in Jilin) and Liaoning were firmly under control of the Korean Goguryeo. Only during the 5Th Century did the first frictions with Han Chinese Empires arise, when Khitan Tribes were absorbed into Goguryeo in open competition with the Chinese. succeeding Tang Dynasty (618 AD - 907 AD). It was during the Sui Dynasty and Tang Dynasty era's that "Korean" Emmisaries were sent regularly to the Chinese Court in Chang'An (Xi'An). Wars and frictions between Goguryeo and the (Han) Chinese Culture to the South grew more frequent, as Goguryeo slowly entered its final decline. As the best solution to overwhelming pressures Goguryeo became a subjugate state that payed regular tributes to the Chinese. Or, at least that is the Chinese historic vision and version. The Korean one differs significantly, and Koreans usually see Goguryeo as the first Korean ethnic State, that was threatened and finally subdued by the Han Chinese, in an unsympathetic way. Among Korean Nationalists sores about events surrounding Goguryeo remain. Although Goguryeo was a tributary state, it was also a major power, by far the dominant one among the three Korean Kingdoms on the Peninsula. Seen as a local threat and for other reasons, the Tang finally conspired against Goguryeo by joining as an allied force in the war of the small Silla Kingdom against it. Map showing China and the extend of the expanding British Empire in 1860 AD and the locations of several extorted Treaty Ports. Already by 1870 AD Japan was attempting to enlarge its influence in the region as well, adopting a policy of active coercion of the Koreans to engage in cultural and trading contacts. Beforehand mainly engaged with the Chinese Culture and Empire, Korea saw its large protector state increasingly weakened by Colonial Powers, Wars and Civil unrest. 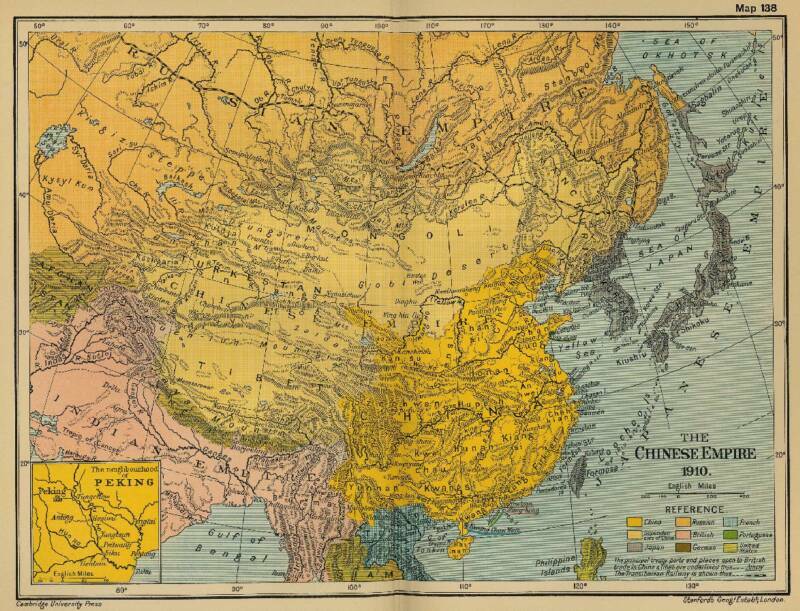 Both Japan and Russia were eying Chinese Possesions in Manchuria and influence in or dominance over the strategically located Korean Empire. Fearing the compitetion from Russia over both the Manchurian Territories and the Korean Peninsula, Japan resolved to end the centuries-old Chinese suzerainty over Korea. In the process Japan could gain access to Korea’s coal and iron ore deposits would benefit Japan's growing industrial base and help its further expansion in East Asia. invasion of Korea, capture of its (Chinese supported) Emperor and the installation of a pro-Japanese Government. Naturally, this meant war with China. In a brief war in 1894 AD - 1895 AD the Chinese were expelled from most of the Korean Peninsula by Japanese Forces. Furthermore, the Chinese Empire was dealt another blow seeing the modernized pride of the BeiYang navy utterly defeated in Battle at the Mouth of the Yalu River (currently the border-river between Liaoning Province and North Korea) with the much better equipped Japanese. 8 out of the 10 Chinese Vessels were sunk. After the destruction of the best elements of the Chinese Navy, the Japanese were free to pursue their expansionist policies ruling the Sea of Japan and the waters around Korea as well as the Yellow Sea. Arthur, 4 new treaty ports to be opened and China had to pay war indemnities once more. The Manchurian Provinces including Jilin were safe from the Japanese for now but China was renedered powerless to resist. It was the beginning a long and controlled Japanese build-up towards complete dominance in Eastern Asia. The next strategic opponent was Russia, with considerable forces in the North-East. AD and 280 AD. Not much thereafter they were absorbed into the Goguryeo Kingdom which had arisen from territories in Jilin Province. Sporadic archeological finds are all that remains of these early inhabitants. The recorded history of the regions that now form Jilin Province begins with the Years of the Han Dynasty (206 BC - 220 AD), at the beginning of which large parts of North-East China were in the hands of the Khitan Nomadic Tribes. The Khitans were primitive barbarians who had no cities and Han civilization of the time reached nowhere near these far regions, however emenating from the Korean Peninsula was the Rise of the Goguryeo Kingdom of the North-East. recorded existance in 37 BC. 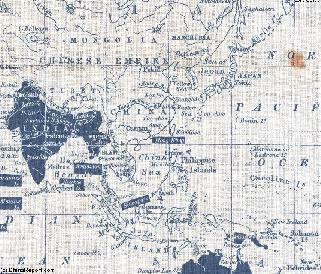 By many Koreans it is considered the first State on a Korean Ethnic Basis in history. 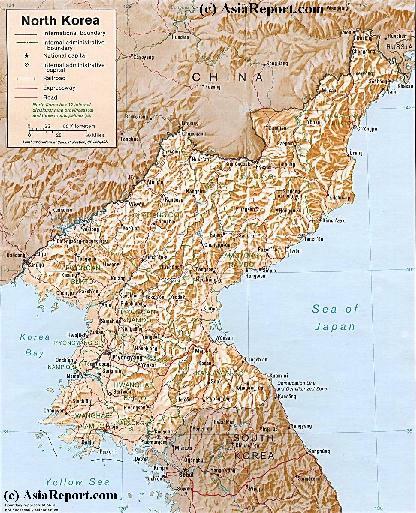 While the Han were fast developping contacts and were indeed expanding into these far North-Eastern Regions by means of establishing colonies and trading posts Goguryeo would have the Time and space to expand to rapidly grow into the major regional power in Manchuria and on the Korean Peninsula. As recorded, by the second century BC the small border state of Wiman Joseon had the audacity to challenge Emperor Wu Di of Han and in 109 BC Chinese armies invaded and annexed parts of the Korean Peninsula (including Liaoning Province and part of what is now North Korea around PyongYang) however Goguryeo including the territories of todays Jilin Province would continue for centuries more in prosperity. (At the same time the Han Empire mounted military expeditions into Siberian lands as far as Lake Baikal and beyond establishing military bases slowly encircling Goguryeo). BaiYun Shan). 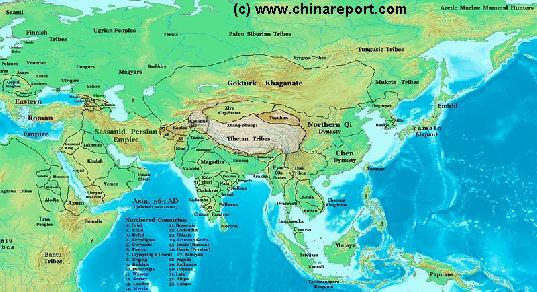 The Han Dynasty in the South-West in China fell in 220 BC. Without Han competition Goguryeo soon dominated an conquered neighboring tribes and eventually occupied parts of the 3 current North-Eastern Provinces (Manchuria) as well as the majority of the Korean Peninsula except the far southern tip. One of the Goguryeo Kings, Gwanggaeto the Great (391 AD - 412 AD) was a highly energetic monarch who is remembered for his rapid military expansion of the Kingdom. Gwanggaeto's exploits have been recorded on a huge memorial stele (erected by his son, King Jangsu) located near present day Jilin City. Full Documentary on World War 2 from the Japanese Persepctive. In color film!! Great Historic Documentary fullof rare footage ! 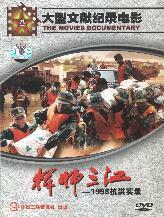 "1998 Yangtze/Songhua River Flood Disaster & Relief"
Part 3 of 'Welcome to Korea' - dealing with the stories surrounding Dear Leader Kim Yong Il. The Russo-Japanese War of 1904 AD was a natural result of Russian-Japanese competition over control in Manchuria and Korea, the basis a valuable ports for which to ship the rich mineral wealths of these regions to National Industries. Earlier, a part of China (Jilin Province and HeilongJiang), the entire Maritime Province (Primorsky Krai) including the island of Sakhalin had been ceded to Russia by the Treaty of Aigun (1858 AD.) At the Time, China, which had just lost the Opium War with Britain, was unable to act to prevent this knowing the Russians would declare war if the Treaty was not signed. Relating things back to the Territory of Jilin Province, access from Manchuria to the Sea of Japan was blocked by this act. Instead, the Russian Empire went ahead constructing its first fresh waterport in the far East, the Port of Vladisvostok (1859 AD). By 1903 AD the Trans-Siberian Railway had been coonected, establishing direct railway links between Moscow and Vladivostok. However, due to the fact that Vladisvostok Port could only operate during the summer months, Russia kept searching for a better alternative. Hence, mutual eyes fell on the attractive all year round port of Port Arthur (Dalian) on the Liaodong Peninsula, a port that had already nearly fallen into Japanese hands in 1895 AD. In fact, immediatly after the Japanese had left Port Arthur in the aftermath of the Sino-Japanese War and the Shimonoseky Treaty (1897 AD) a Russian Fleet appeared off the City and Port, with the Russian extorting its lease to Russia and opening to international trade in 1898 AD. by constructing a railroad between Harbin, Shenyang and Port Arthur (Dalian), all on supposedly Chinese Territory. Thus, the Russian had checked the Japanese, who would no doubt, respond in Kind. In 1900 AD as a direct result of the Boxer rebellion and events in Beijing, the tensions in Manchuria were increased when Russia sent troops into the North-East to protect their interest. This was in clear conflict with Japanese interests. 1904 AD was the year of final confrontation. Although the Japanese were sorely aware of Russian influence emenating from Vladivostok into its annexed Korea, in the War the major theatres of operations were Southern Manchuria (Liaoning Province), specifically the area around the Liaodong Peninsula and Mukden. Battles were further fought on the seas around Korea, Japan, and the Yellow Sea. 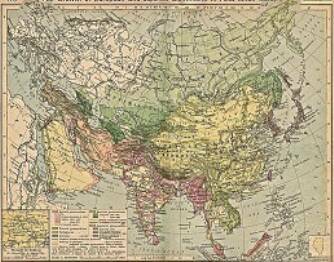 The War ensured the Russian defeat in the region, leaving only the Chinese as opponents over Korea and Manchuria. 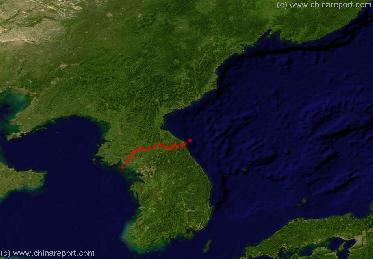 In an intelligent strategic move Japanese Armies landed near Inchon in Korea first capturing Seoul, The Capital, then moving into North Korea (and East Jilin Province) in order to threaten the secondary Russian Harbor at Vladivostok. Other Colonial Powers, Britain, France and Germany stood by while Japanese powers extended. Although Korea was invaded in 1905 AD it was officially annexed by the Empire of Japan in 1910 AD. During the dramatic period of Japanese occupation, Korean People and their Culture suffered immensely, among things resulting in an influx of Korean migrants over the (unspecified) Border into the Manchurian Province of Jilin. During the Japanese Occupation Korean Language Education was banned, Koreans were expected to adopt a Japanese Surname, and although Koreans were treated as 2nd rate citizens, all policies were aimed at complete assimilation with the Japanese Culture. The ordeal only ended in 1945 AD with the final capitulation of the Japanese Forces in all Asia, after which the Japanese could be demobilized and sent home. In 1945, the Soviet Union and the United States agreed on the surrender and disarming of Japanese troops in Korea. The Soviet Union agreed to accepting the surrender of Japanese weaponry north of the 38th parallel and the United States would take the surrender south of of this parallel. However, the Korean Peoples were not consulted in any way on this decision. Further indecision by the two World Powers, already locked in the beginnings of the Cold War, provided for the creation two seperate Korean States in 1948, the North and South. Although War broke out only two years later resulting in the three year long Korean War or "Conflict" (1950 AD -1953 AD) the new States and the Korean problems remain, lasting untill this very date. Across the border of the North Korean State, inside Jilin Province of the Peoples Republic of China created on October 1st 1949 AD, people would have to adapt to the situation. Especially at Yanbian Korean Autonomous Prefecture in Jilin Province, since the end of the 19Th Century increasingly the home of the Korean Ethnic Minority of China. Before and after 1949 AD, the Chinese Communist Party and their Ethnic Korean Caders in the Yanbian Prefecture played a major role in the establishment and later support of the new North Korean State.- To be Continued ! !